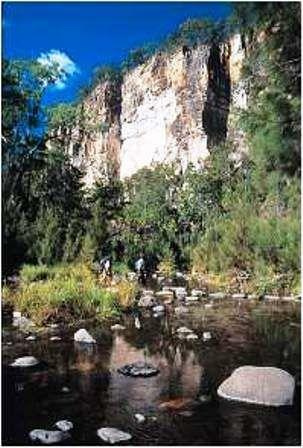 Carnarvon Gorge is located between Roma and Emerald. From Roma, head north 90Km to Injune and then a further 111km to the Carnarvon Gorge turn-off, along the Carnarvon Development Road. From Emerald, head south 65 km to Springsure and then east 70 km to Rolleston. 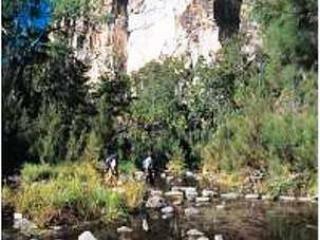 From Rolleston it is a further 61km south to the turn-off to Carnarvon Gorge. Take the signed turn-off to the park. From the turn-off, you will drive over approximately 20km of unsealed road to the park. Following heavy rain, the unsealed roads may become impassable. Creeks are subject to flooding. It is advisable to check with the Wilderness Lodge for road conditions. Flights are available with Qantas Airlines. Flights depart from Brisbane to Roma with a light aircraft connection to the Lodge. Prices and schedules are available on application.